CCDT’s Child Protection team organised a week long celebration to observe the Child Rights Week, which is celebrated from 14th (Children’s Day) to 20th November (International Child Rights Day). It was on November 20, 1989 that the United Nations Convention on the Rights of Child (UNCRC) came into being. The UNCRC consists of 54 articles that set out children’s rights, and how governments should work together to make them available to all children. India is a signatory to the UNCRC. The week was inaugurated on November 14th where children penned down their dreams, aspirations, and hung it on a wish tree. Children jotted their desire to become a doctor, a teacher, a police officer, a social worker, a dancer, and so on. They will leave no stone unturned to realise their full potential, and will make their parents and communities proud. During the drawing activity on the theme ‘How to Protect Oneself’, children depicted the various issues around safety they have faced in the community such as people drinking alcohol in public spaces, poorly lit lanes, toilets with broken doors and no latches; and what steps they took to ensure their safety while they converted them into safe spaces. 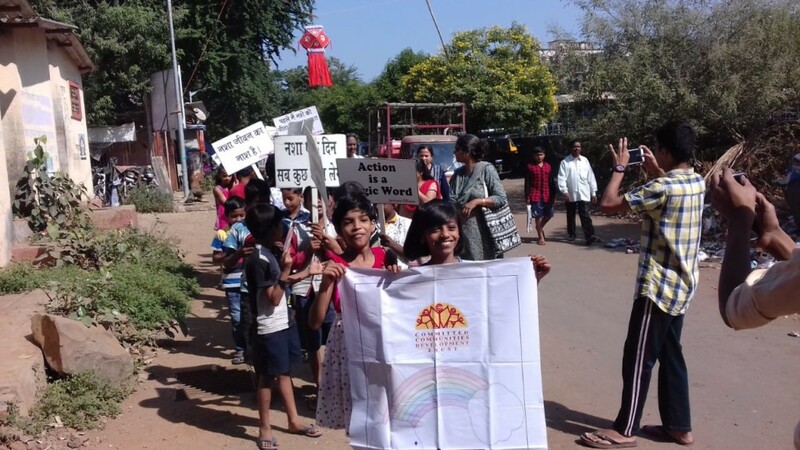 The community level Child Protection Committee was formed to create a protective environment for all children in the , took the initiative and collaborated with Jeevan Dhara and Childline and organised a rally in the Shivaji nagar community against substance abuse. The community reverberated with the slogans such as ‘Nasha Shanachi Majja, Ayushabhar Saja (Addiction is fun for a moment, but it’s a punishment for lifetime)’, ‘Tumchi Nasha, Sharirachi Durdasha (Your intoxication is body’s trauma)’, ‘Drugs aren’t cool, it makes you act like a Fool’, ‘I’m free to be me, when I’m smoke free!’, ‘The Best Me is Alcohol Free’ motivating community youth and adults to make it a safe substance abuse free community for its children. To assert their Right to Play children participated in various creative and fun filled games such as puppet making, ludo, drawing, rangoli as well as a kho-kho. Children reclaimed their right to enjoy their childhood by engaging in various games and activities and having fun. A film ‘Guttu’ was screened for children highlighting the importance of education. A discussion was held with children after the film was screened. During the discussion children voiced how education is a window of opportunity to build their careers, and realise their dreams. The child volunteers performed a mime act in the Shivaji Nagar Community on how unsafe places were converted into safe places. The group won a special prize for their performance, and were appreciated by the Dr Raies Khan the founder of Mif Mother Jarina Foundation who demonstrated appreciation of CCDT’s work. Child Rights Week ended with a special mention to the parents who look after their child’s future and dreams.